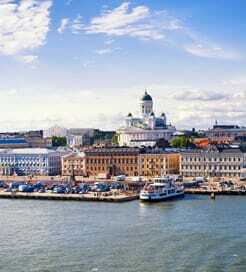 Finland - or to give it its official title, the Republic of Finland - is situated in Northern Europe. Nestled between Sweden and Russia, it is known around the world for its enchanting, snow-capped landscapes and balmy, radiant summers. Although they have a reputation for being reserved, the Finnish people are warm, inviting and possessed of a self-deprecating wit. Despite its vastness, Finland has no shortage of travel options and is easily accessible. With direct crossings from Germany, Poland, Russia, Sweden and Estonia, one of the best ways to reach Finland is by ferry. Helsinki is one of the busiest ports in Scandinavia and is where the majority of ferries to Finland arrive. Secondary ports include Turku and Naantali, both a little further along the south west coast. There is also a daily sailing across the Gulf of Bothnia from Sweden to the Finnish port of Vaasa which provides a short cut to the alternative of driving hundreds of kilometres. Some of the crossings between Sweden and Finland stop at the Aland Islands - an autonomous region of Finland. Not just a great destination but also exempt from EU tax regulations which allows the sale of duty free goods on board during the trip to mainland Finland. The most popular and frequent crossing runs between the Estonian port of Tallinn and Finland’s Helsinki. Connecting one capital city with another, the biggest names in the region such as Viking Line and Tallink Silja operate the ferries with journey times as little as 2 hours. Ferries in this part of the world are particularly luxurious with their decks stuffed with malls, eateries and bars. Many passengers book a mini cruise just to enjoy the on board experience without actually getting off the ship when it docks in port, before heading away from the country for the return leg of the journey. Finland itself is criss crossed with railways, stretching from Helsinki all the way to Kolari in Lapland. Finland is also home to one of Europe's most comprehensive coach networks, covering more than ninety percent of public roadways, though of course it’s simple to explore with your own vehicle too. For more information, please visit our Ferries from Russia to Finland page. For more information, please visit our Ferries from Estonia to Finland page. For more information, please visit our Ferries from Germany to Finland page.